Welcome To Our Mini Forums! Learn from the mistakes of others who have gone before you! Hi fellow hydro nut! 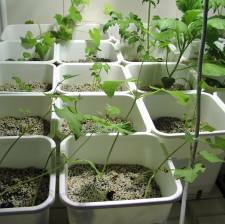 Welcome to our fun and free Hydroponics Forum. Here you will access a goldmine of information to round out your knowledge base. There is no member login or registration required! (You might just call this a "Mini Forum"). Feel free to ask a question, write about your own experiences, or comment on any subject posted by others. The idea here is: ask a question, or answer one. In this way, our Forum truly becomes a melting pot of great ideas, alternative solutions and creative problem-solving. *Note: we strongly urge you to try our Troubleshooting Page first, before posting a question. Chances are very good that you will find your answer immediately here. Problem still not solved? You'll find a submission box below for asking your own question. It's easy and free. Below the submission box, you will find recently asked questions on a score of subjects; interesting reading and a great source of new ideas! Please be patient. Your post does not automatically appear, it goes through an approval process. This is a free service, and at times of high volume, it may take a couple days to see your question & answer appear. Compose your post offline. It's easier for you to type out your submission first in NOTEPAD (look under accessories), proofread it and get it right, then copy-and-paste it into our box. Jump right in. PLEASE feel free to answer a question yourself, or offer advice to others. We can all benefit from our collective wisdom here. We are not botanists, nor are we certified hydroponics specialists. We are just enthusiasts willing to help, and we welcome comments, suggestions and submissions from all of you! Your questions and answers will serve to broaden our own expertise, and help enhance the understanding and practice of hydroponics worldwide. Ask a question, tell your story, or share a solution with others! Do you have a picture to add? Great! Click the Browse button, and find it on your computer. Then select it. Was wondering if anyone could recommend a brand of water chiller. Reading reviews and not convinced ? Thanks! How long can I keep a batch of nutrient? How long will my lettuce keep growing? I'm harvesting outer leaves, and they still look good, but need the tote for a new batch Ive started.